Kudelik, Gail and David W. Leonard. "Lesser Slave Lake". The Canadian Encyclopedia, 24 May 2018, Historica Canada. https://www.thecanadianencyclopedia.ca/en/article/lesser-slave-lake. Accessed 24 April 2019. The earliest non-Indigenous settlement in the area evolved at the west end of the lake, off Buffalo Bay, where the North West Company established a post (1802) and the Roman Catholic Church followed with a mission (1872). In north-central Alberta (photo by Archie Landals). Lesser Slave Lake, 1168 km2, elevation 577 m, located in central Alberta, about 200 km northwest of Edmonton. Lesser Slave Lake is fed by numerous small rivers, including the Swan, Driftpile and East and West Prairie, and discharges east via the Lesser Slave River to the Athabasca River. Explorer Alexander Mackenzie (although he never saw the lake) recorded the name the Cree had for the lake. They had named it for the "strangers" or slavey who earlier had lived in the area. "Lesser" was added later to distinguish it from Great Slave Lake, further north. The first non-Indigenous to arrive at Lesser Slave Lake was David Thompson in 1799 and he traversed it in 1802. 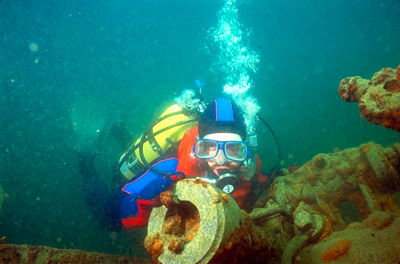 The earliest non-Indigenous settlement in the area evolved at the west end of the lake, off Buffalo Bay, where the North West Company established a post (1802) and the Roman Catholic Church followed with a mission (1872). Ten kilometres south of this community, at Stony Point, Treaty 8 was negotiated with the district Cree in 1899. At the site of the treaty signing, another community began to grow and eventually become the town of Grouard. The town of Slave Lake on its southeastern end had its origins in the community of Sawridge. Located at the lake's outlet, Sawridge also began as a fur trade outpost. By 1910 it was a steamboat centre, until the arrival of the Edmonton, Dunvegan and British Columbia Railway in 1914, shortly after which the rail town of Slave Lake was subdivided. There are also several Cree Indian reserves along the south shore of the lake, held loosely together by the Lesser Slave Lake Regional Indian Council. 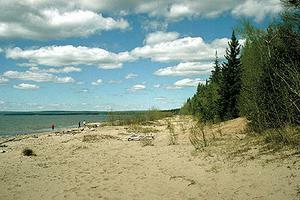 Lesser Slave Lake is known for the sandy beaches on its south and northeast shores. It is an important staging and feeding area for tundra swans and other waterfowl and is the site of Canada's northernmost migration monitoring facility. Also located here is the Boreal Centre for Bird Conservation, an educational and research facility for studying boreal birds on their breeding grounds. Two provincial parks, Lesser Slave Lake on its northeast shore and Hilliard's Bay on its northwest, protect sections of its shoreline. The main economic activities are oil and natural gas exploration and development and forestry. Tourists are drawn to its beaches and sport fishery. Its waters also support a commercial whitefish fishery. Slave LakeA profile of the Town of Slave Lake from AlbertaFirst.com. Features local economic data and related community information.